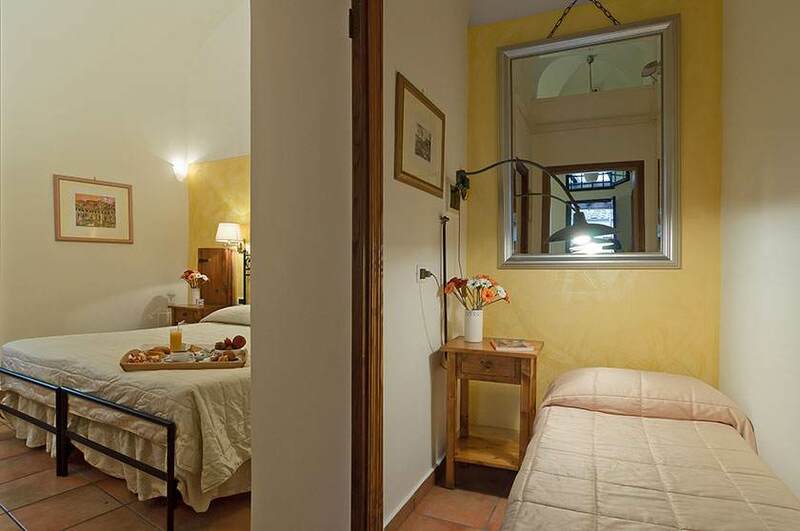 Book our suite in the center of Rome! 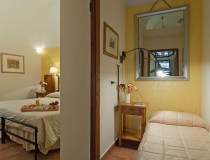 The Junior Suite is cosy and comfortable with a stylish bedroom and separate studio. 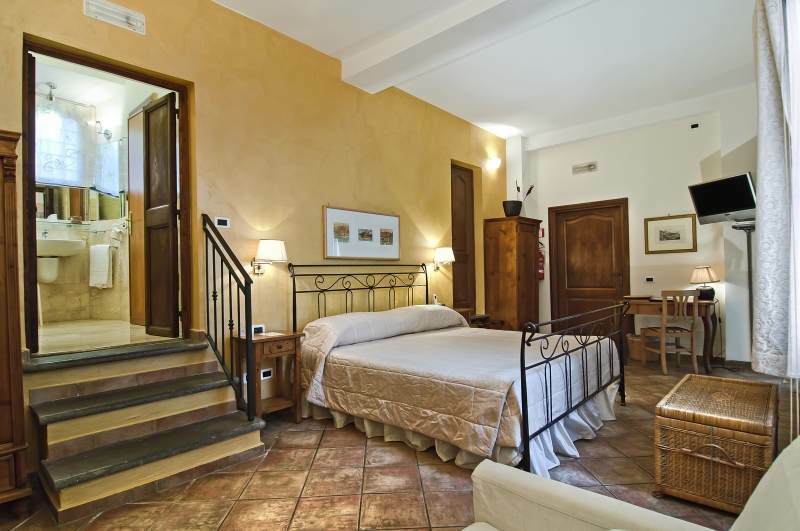 The elegantly furnished main bedroom has a beautiful vaulted ceiling and large window overlooking a peaceful private courtyard. 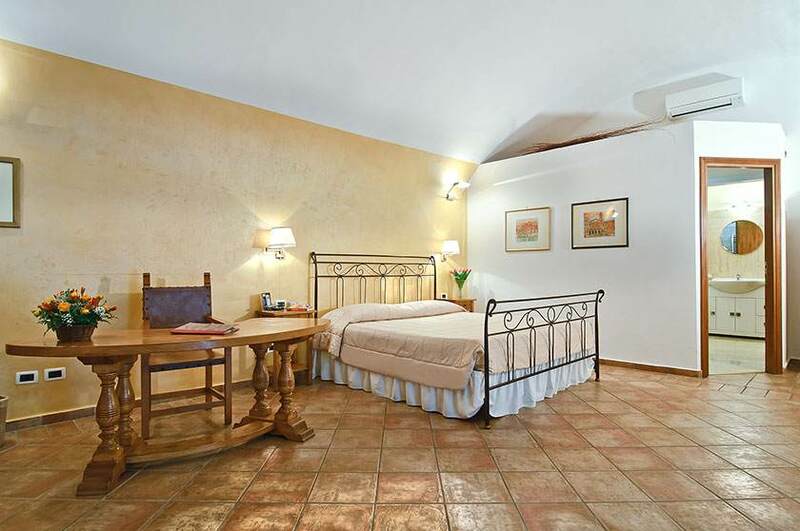 Next to the bedroom is the studio with a large desk under a cross-vault and a comfortable sofa bed. 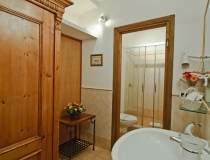 The suite is fitted to a high standard with all the modern amenities. The queen-size bed is dressed in soft cotton sheets and the bathroom well-appointed with large shower and the finest Italian tiles. BATHROOM: Comfortable and modern with beautiful Italian tiles, shower, hair-dryer, towel heating, smooth cotton towels and natural Mediterranean soaps, shower gels & hair products. 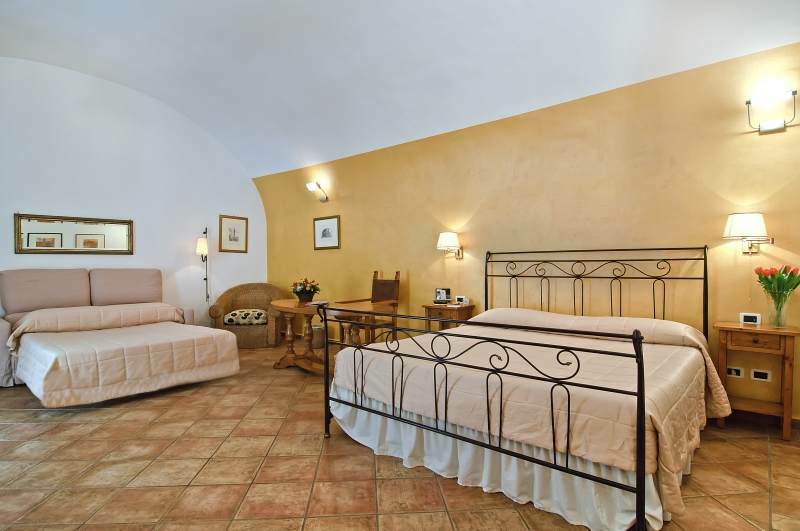 The Suite is a spacious, bright room with two large windows overlooking our peaceful Mediterranean garden. It is a charming and romantic room with a wonderful queen-size forged iron bed, elegant wood furniture, a large desk and comfortable sofa, that converts into an additional bed, all with tasteful fine fabrics . The bathroom, in fabulous Travertino marble, has the added luxury of having a corner Jacuzzi bathtub, as well as a powerful shower, all adding to this accommodation being the most perfect for special occasions. 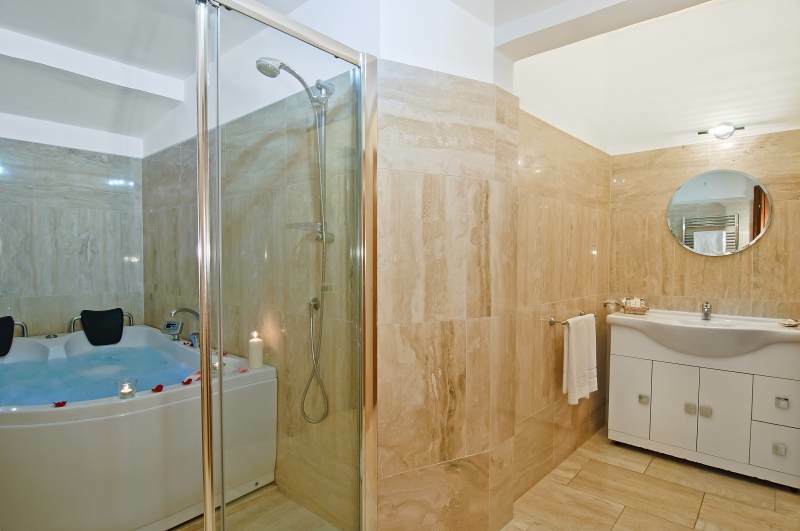 BATHROOM: Comfortable and modern with beautiful Italian Travertino marble, corner Jacuzzi bathtub, large shower, hair-dryer, towel heating, smooth cotton towels and natural Mediterranean soaps, shower gels & hair products. 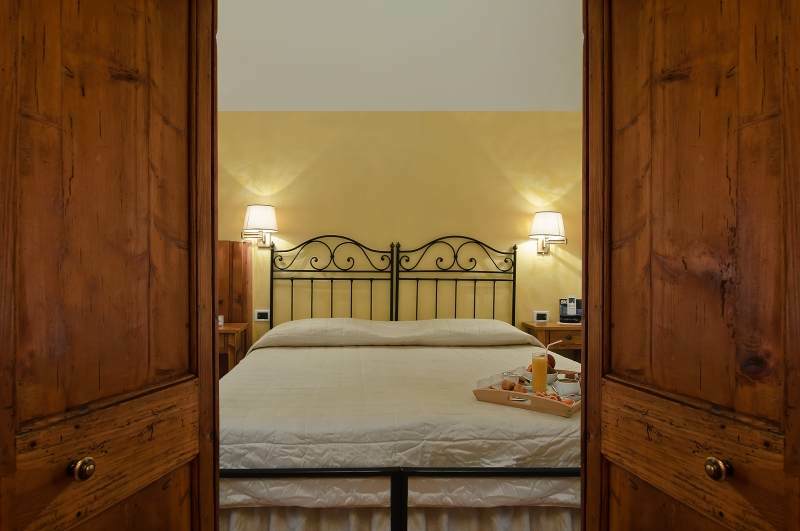 The Family Suite has a traditional Tuscan feel with its warm white and cream décor blended with beautiful Italian cotto tiles, natural wood and forged iron work. The spacious living area features a wonderful queen-size bed dressed in fine fabrics, a large cosy sofa, that converts into another comfortable double bed, and a magnificent antique desk, as well as all the modern amenities. 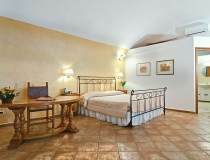 There is also another roll-away bed that makes this suite a very comfortable stay for all the family. The beautiful bathroom of grand Travertino marble, boasts a luxurious double Jacuzzi bathtub, as well as a powerful shower, to add to your comfort. 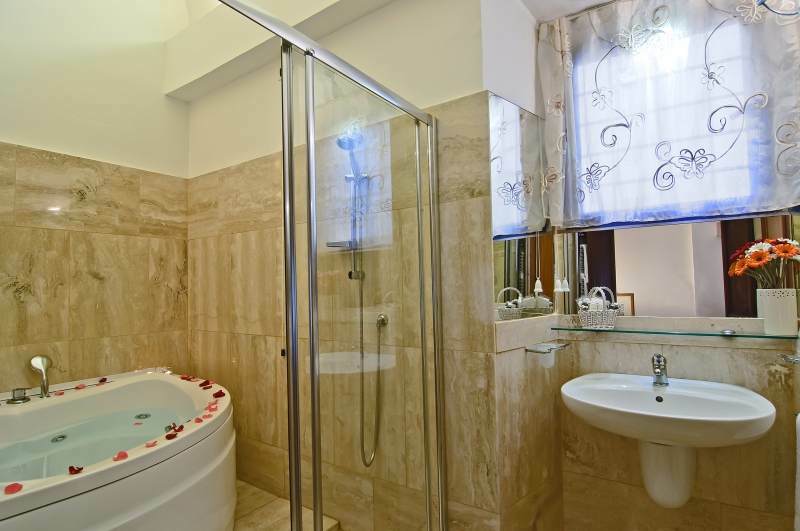 BATHROOM: Comfortable and modern with beautiful Italian Travertino marble, luxury double Jacuzzi bathtub, large shower, hair-dryer, towel heating, smooth cotton towels and natural Mediterranean soaps, shower gels & hair products.